The Lost Heart of Asia. Colin Thubron. London: Harper Perennial, 1994. 374 pages, includes one map, an interview with Thubron, an essay by The Times (London) columnist Julia Llewellyn Smith, comments from critics and Thubron’s personal travel reading recommendations. About the author: Colin Thubron was born June 14, 1939 and has written nine books about his travels around the world. His first book, Mirror to Damascus, was published in 1967. After fracturing his spine in an automobile accident, he traveled to Russia, which was not a typical travel destination in 1978. After Among The Russians was published, Thubron focused on hard travel books, even learning Chinese and Russian so that he could talk to the people he met. 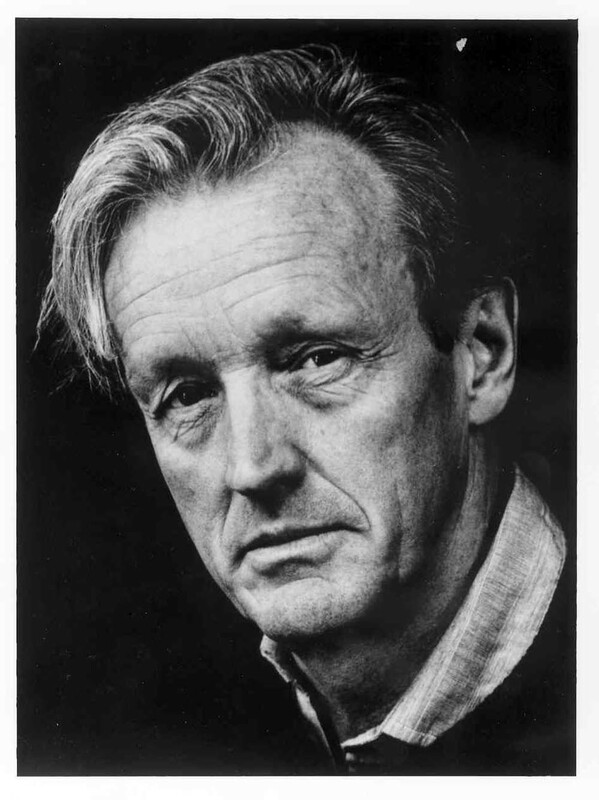 He has received many awards including the Royal Scottish Geographical Society Mungo Park Medal (2000), the Royal Society for Asian Affairs Lawrence of Arabia Medal (2001) and The Times named him one of the 50 greatest postwar British writers. His latest book, To a Mountain in Tibet, was published in 2011. He is president of the Royal Society of Literature. 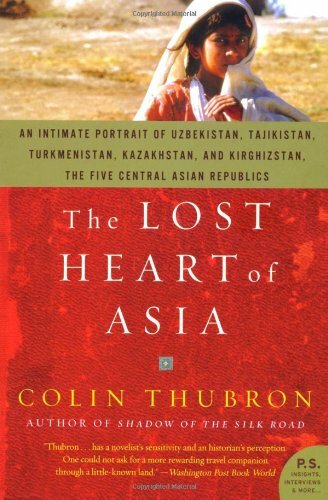 Colin Thubron’s The Lost Heart of Asia takes the author through the five central Asian republics, Uzbekistan, Tajikistan, Turkmenistan, Kazakhstan and Kirghizstan, just months after the end of the Soviet Union. He discovers group of nations that the soviets tried to purge of any culture or identity. Suddenly, these states were cut off from government, military and infrastructure. Thubron visits these nations during this turbulent period, giving readers his experiences with the people of each nation and explaining history and folklore that makes these places special. Thubron is not a traveler that takes the easy route. He travels by train — fourth class, by foot, by bus and by taking rides with villagers in cars that barely stay in one piece. The hotels he lodges in are creaky and, at times, unsanitary. He tries to remain as non-judgmental as he can, being polite to even to a man trying to swindle money out of him. Thubron writes with the skill of an educated English gentleman. His prose is formal, but vivid in detail. He requires his readers to come along with him and see the scenery, meet the people, taste the food and invest some time to reflect on the lives of these people. Two elements of the book stood out while I was reading it. Thubron spends a lot of time with the people of these areas and presents a group of nations that hold very little hope for the future. During his visit, about four months, he witnessed people suffering from the hyperinflation of a post-communist economy and groups of Russians, hated by the locals, who had no where to go. The Soviet Union assigned their grandparents to work in these states, and the motherland has now abandoned the grandchildren. While riding a train to Bukhara, a schoolgirl approached Thubron and he chatted with her. While he doesn’t give her age, she is still in school. Thubron innocently asked her what she plans to do when she finishes school. The girl said she will “be a young woman, then a mother, then an old woman … then a corpse.” Many people repeat this tone of finality throughout Thubron’s journey. The second aspect of his book that stands out is his boyish sense of adventure. Thubron did his homework and knows about historically important places along his trip. After all, Alexander the Great and Ghengis Khan came through parts of these nations. He takes adventures to ruins, looking for proof of these nations’ past glories. About half way through the book, he decides to travel the mountain around Shakhrisabz, Uzbekistan, searching for the castle of the “Veiled Prophet of Khorasan.” He approaches his trip with a childlike sense of excitement. These little explorations seem to confound the locals but provide a little levity to the bleakness of the people’s lives. While the book is near perfect, I had trouble keeping track of where Thubron was in many sections of the book. While there is a map showing where these five nations are located, he never refers back to it. At times I had read four or five pages without realizing that he had entered another country. Other than this small issue, this is an excellent travel book. It is deep and not simply a travelogue. After reading it, I have gained knowledge about a culture that was nearly obliterated by Communism. It is easy, being an American, to feel like I am having a tough time. Sometimes money is tight, but even when I am at my worst financially, I’ve never had to pluck the eyes out of a sheep’s head so that I could have a meal. Thubron’s trip helped me appreciate how much easier our lives are in the western world and how much harder people in other nations have to work for so much less reward.